The ions generated on the integrated ring electrode are efficiently distributed across surfaces, including uneven surfaces, due to the pulsating air jet of the rotating cleaning nozzle. The pulsating air jet has a higher cleaning effect compared with a steady air stream. This ensures that even textured surfaces are discharged and cleaned efficiently. The rotating cleaning nozzle is located in the centre of the ring electrode. A HAUG discharging power pack is connected to the Mobile Circle Cleaner supplying the high voltage to the integrated ring electrode of the. The ring electrode of the Mobile Circle Cleaner is safe to touch when used properly. An edge protection prevents damage to the surface to be cleaned in the event of inadvertent contact with the Mobile Circle Cleaner. The ergonomically shaped grip ensures that the Mobile Circle Cleaner can be handled conveniently. The air stream is regulated using the trigger. 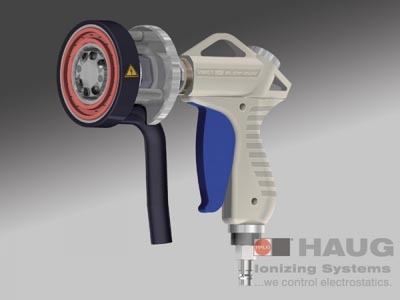 The handle can be equipped with a plug connector for a single-hand compressed air coupling.